Last Friday I moved into my new apartment. 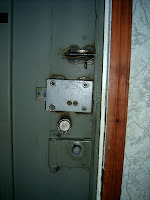 As you can see, I am secure inside the apartment, with a door like Fort Knox between me and anyone that might want to get at me. Everyone on our team has been sick and so I could hardly expect to escape the fl u that was going around. It gave me a good chance to settle into my apartment last weekend as I spent the whole time resting and drinking lots of fluids and eating soup that I made in my new kitchen (oh I love my new kitchen…). The view from the kitchen isn’t much to get excited about. 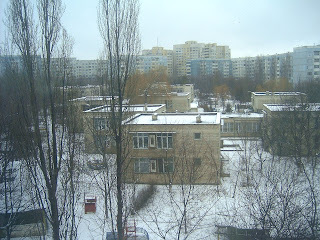 As you can see, here I am in the midst of a jungle of soviet-style apartment buildings, with some kind of school or kindergarten right across the street from me. The view from the other side can be seen from the balcony of my bedroom, and it includes the Chisinau ‘zoo’. They say that sometimes you can hear the lions roar in the morning. I haven’t heard them yet and not sure if I will. The zoo here is pretty lame and if it were in Canada there’s no doubt the animal rights’ activists would be up in arms, but hey, it’s all we’ve got. And at least the bears and lions and tigers are being cared for more than all the stray dogs that wander around Moldova (It would break your heart if you’re a dog-lover). 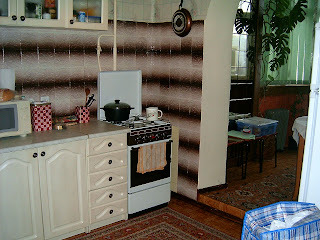 As I publish this blog it is now over a week since I have been in my apartment and my internet still isn't connected. They came today but my landlady didn't tell me that they would come first thing in the morning and silly me, I went to work, thinking they were coming in the afternoon. So now I have to wait ANOTHER day for my internet and it's so hard not to have access to Skype and chat to keep in touch with my family in the evenings! All I can do is briefly check e-mails at work and occasionally take a bit more time to post a blog! This week we advanced a bit on our residency application process. One day – as can only happen in Moldova – the group of four of us who are proceeding together had a call from the lawyer to meet him outside a certain government office. We expected to go in with him to sign some documents but instead waited outside on the street until he came back and, there on the street corner, had us sign our work permits so that he c ould prepare them for the next step of the process. That was it – a quick trip downtown, standing around outside, sign a paper, then back to the office. The next day we had to go to the lawyer’s office to finalize all of our documents, with more photocopies of documents we had already submitted. 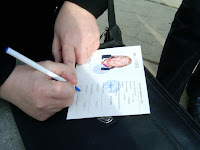 Then the next morning Claudia and I were at the government department where we had to submit the final batch of official documents so that we could receive our residency permits. That went fairly smoothly, with the official who was taking the necessary photo even making suggestions and giving opportunity for the photo to be a nice one! Included with the documents we had to leave our passport so were issued a temporary document. This coming Friday afternoon we go back, and if all goes well, Lord willing, we will receive our permit. If, however, for some strange reason, our application for residency at this point is denied, that will be it. I will have to leave the country. Hopefully, though, that will not be the case. Postscript: As I edit this post again, trying to get the pictures to display, it is with the news that although things are looking good for me and Claudia and the Dutch family, our American friends are not faring so well. It looks like 7 of our team-mates will have to leave the country for the next three months. Please pray for them! Posted by Barb at 11:05 a.m.
BTW I live in Washington State.